If you’re new to our office, it’s nice to know what will happen the first time you visit us. Here’s a short description of what you can expect, so you’ll feel comfortable knowing exactly what will happen. On your first appointment, we’ll ask that you come in 15 minutes early to fill out some paperwork. Otherwise, it can be found here and filled out ahead of time. Once that’s completed, you’ll see Dr. Budaj for a consultation and exam, and if necessary, we’ll take X-rays to get a clearer idea of what your health concern is. We’ll have a discussion with you to make sure we address your problems and find the cause of your health issue. You’ll understand exactly what’s happening in your body, and we’ll answer any questions you might have. We’ll schedule you to come back for your second visit, during which Dr. Budaj will go over a report of his findings with you. Before proceeding, we’ll make sure you feel fully informed and discuss any questions or concerns you may have. Once we have your permission, we’ll continue with chiropractic care. We’ll never tell you that you have to come in for care if you don’t want to. You’ll get Dr. Budaj’s recommendations such as maintenance care to prevent future problems, because disease is progressive, and will never stop or get better on its own. Chiropractic care will help improve your spine and prevent the progression of the existing problem, keeping you healthy. We strongly recommend that you return for regular check ups to help your body stay in shape, but the choice is always yours. 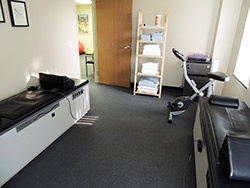 We hold regular classes in our office to help educate our patients and their friends about chiropractic, functional medicine, and what we do at Bloomfield Wellness Clinic. Our new patients are welcome to attend these to educate themselves on what they can do to keep and improve their own health and that of their families. In addition to this, we hold monthly classes on various health topics, which you’re also welcome to bring your loved ones to. If you’re not able to make it to these classes, you can find links to our class topics here, so you can read them on your own time.